Parallel sun rays enter the drop, partially reflect from the opposite side then leave towards the sun. Those deflected least (bright line) form one point of a rainbow's outer coloured edge. Rays entering through a ring around the drop each form a point on the rainbow. 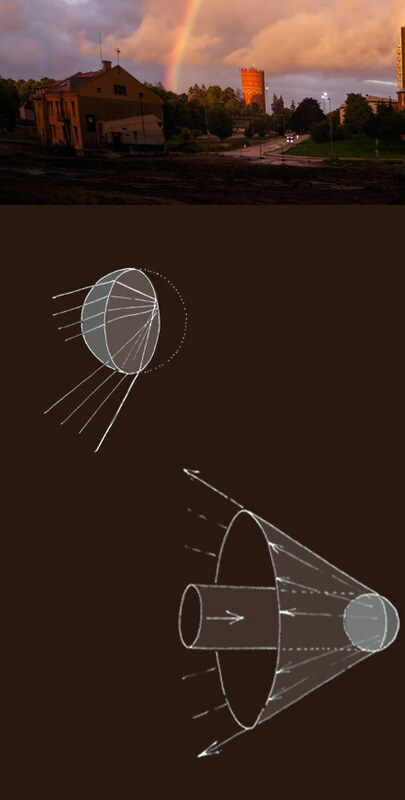 All the possible rays make a cone in the sunward direction. 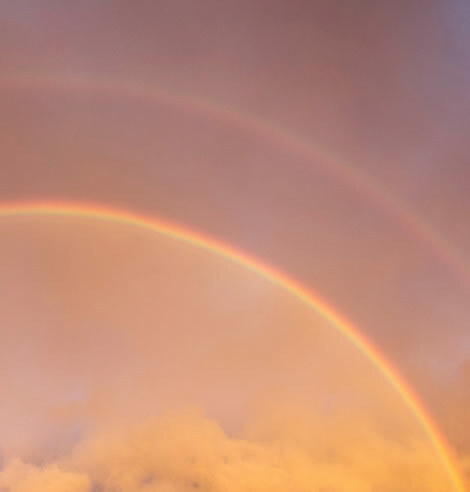 The sky transform ~ Why do we see patterns in the sky, rainbows, halos, glories.. ? A single raindrop does not a rainbow make. 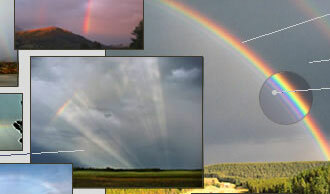 How does the sunward deflected light from a single raindrop transform into a huge rainbow in the sky opposite the sun? 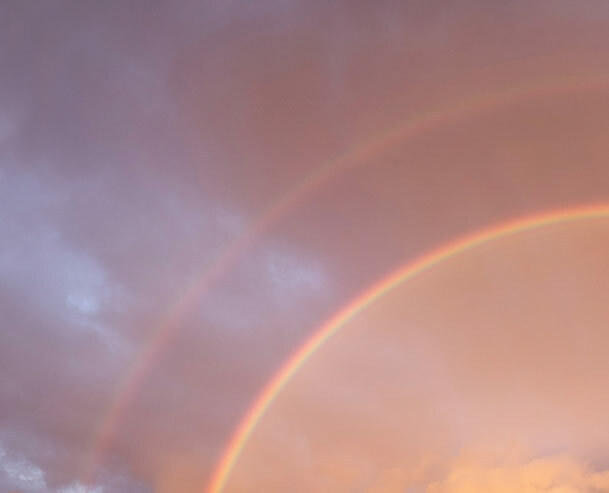 Millions of raindrops across the sky must contribute individual rainbow speckles but how do they reproduce the pattern of light from a single raindrop? The problem is actually a more general one. An individual ice crystal refracts and reflects sunlight and millions of them combine somehow to form a highly geometric halo. An individual cloud droplet forms a diffraction pattern that is somehow projected on the sky by the combined action of millions of droplets. How then is the scattering pattern of an individual droplet, ice crystal or raindrop writ large upon the sky? Let's look at an abstract particle that magically (we need not enquire how) scatters sun rays backwards in the shape of a capital letter "L". That is chosen not from some egomania wish for skywriting of my initial but because the symbol's extremities are defined by just three scattered rays which we can label 'a', 'b' and 'c'. Furthermore, "L" has a 'handedness', its flipped mirror image form is distinguishable from the original. Let's make a further abstraction by only considering the three extremity rays. They are sufficient because they uniquely define the "L". Imagine the sky filled with a cloud of these magical particles at a range of distances. Each one of them individually scatters backwards three rays in directions 'a', 'b' and 'c'. There is no interaction between them, they all act in isolation. Now imagine a one-eyed, cyclopean, observer. What does the eye see? 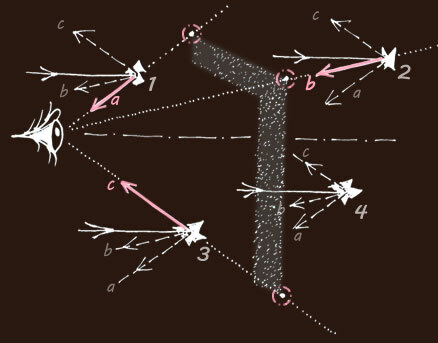 Particle '1' is so placed that its ray 'a' (and only ray 'a') reaches the eye. The eye sees a bright glint in that direction which is at a corner of the "L'. Similarly the eye sees a glint from ray 'b' scattered by particle '2'. Ray 'c' from particle '3' makes a third glint in the sky. What about all the other millions of particles? Take one of them in an arbitrary position '4'. 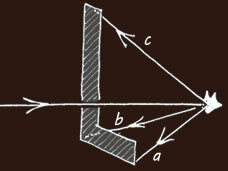 None of its three rays 'a','b' or 'c' reach the eye. No glint is seen. It glints its light elsewhere and might be seen by another creature but to our cyclops it is dark. Similarly all the other particles are dark. The three glinting particles define an "L" in the sky having the same angular aspect to the eye as the scattering angles of the individual particles. There are differences. The "L" appears in the opposite direction - relative to the sun's rays - to that of the particle scattering pattern. The "L" is also inverted. Any shaped scattering pattern or light distribution can be constructed from enough (if necessary infinitesimal) triangular elements. Therefore the demonstration above holds true for all scatterers. Any scattering pattern made by a single raindrop, droplet, ice crystal or dust particle etc will appear in the sky if there is a cloud of similar particles. The pattern appears in the opposite direction relative to the sun's rays and upside down. A single particle scattering pattern directed sunwards will appear in the sky opposite the sun, one directed forwards mainly along the sun ray direction will appear near the sun. Inverted? We do not notice that the pattern is inverted for symmetrical scattering patterns like circular rainbows, coronae and glories. Thus we see a rainbow opposite the sun from millions of raindrops scattering light towards the sun in a cone shape. We see a corona around the sun from a cloud of droplets diffracting light mainly forwards with the sun's rays. We see the complex geometric form of Parry arcs from a cloud of peculiarly oriented ice prisms.